Winter is approaching and in much of the United States, that means very cold temperatures, snow, and ice. Here in the upper Midwest, it gets particularly nasty: we had some amount of ice or snow on our driveway nonstop from October to April last winter. As a homeowner, this change in the season means one thing: what do I need to do to protect my enormous investment in this house from the brutal change in the weather and keep money in my pocket? Make sure the attic is well-insulated. Dress warmly inside and keep the temperature low. Minimize or eliminate use of vent fans. Turn off the heat in unused rooms. Make sure you have a fresh furnace filter. Use an insulation blanket on your hot water heater (if it needs one). Keep blinds and curtains open on the sunny side of the house and closed on the other side. Cook at home using the oven. Microwave a hot water bottle before bed each night, then dip the temperature. What else? Here are twelve additional useful steps for preventive maintenance for your home. These steps will help minimize the wear and tear of the changing of the seasons of your home, putting off potential major repairs for many years. Call an HVAC professional to inspect your furnace and your ductwork. You should always do this before the first winter you spend in a house, as well as every few winters thereafter. It’s essential that your furnace remain in good working order with clean ductwork that’s in good repair, and a professional can properly evaluate things for you quite well. Prepare your fireplace (if you have one). Make sure the chimney’s swept and that the damper opens and closes. Also, if your chimney is made of brick, examine the brick and mortar to make sure it’s in good repair. Have plenty of firewood cut and on hand for use. You may also want to install a screen on top of the chimney to keep pests out. Check your roof shingles and do any minor repairs you can. Ice and snow buildup on a roof can wreak havoc, so make sure that your shingles are in good shape. At the very least, do a careful ground inspection of your roof, but it might be better to just go up there on a ladder and look around for yourself. Replace any worn out tiles you find. Clean out your gutters. Similarly, when the temperature hovers around freezing and you’re facing a lot of melting and freezing water, clogging in your gutters can create a huge logjam of ice on your roof. Prevent most of this by cleaning out your gutters in advance of the winter season, removing leaves and bird nests. Prepare your lawn-care and garden equipment for winter. Drain the oil and gas from your mower, tiller, and weed eater. Put into careful storage any lawn and garden equipment. Drain all of your hoses and put them into storage as well, as sitting water freezing and re-freezing inside a hose can really damage it. Service your winter equipment. Make sure your snowblower starts up after you’ve properly tuned it and put gas and oil in it (as per the directions). You don’t want to go out there and fire up your snowblower for the first time and discover that it needs oil or new spark plugs. Pull all vegetation away from your foundation. Vegetation near your foundation can continue to grow near the warmth of your home, possibly causing the roots to grow towards your foundation. Pull any vegetation near your foundation away from it to keep your foundation in good shape. Check (or install) your carbon monoxide detector and smoke detectors. You should have a carbon monoxide detector near your furnace and a smoke detector in all rooms in the house. Check them all to make sure they’re in proper working order. Trim any nearby trees. If you have tree limbs near your house, particularly ones anywhere near windows, trim them back. When they get weighted down with snow and ice, they’ll bend and perhaps break – and that can spell disaster for your windows or your roof. Seal your driveway and deck. The constant freezing and thawing of a winter season can wreak havoc on unprotected outdoor surfaces. Spend some time in the next few weeks sealing your driveway and your deck to keep the freezing water from damaging your property. Move in your potted plants. As the weather gets colder, your plants will be affected by the temperatures more and more. Move them inside for the winter and place them in an area with adequate lighting to ensure that they live through the cold season. Prepare an emergency kit. 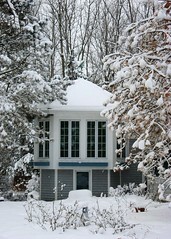 Major winter storms can sometimes result in multi-day power outages. Have an emergency kit with plenty of flashlights, an emergency radio (that’s powered by batteries or hand crank), plenty of blankets, and some food and water on hand in an easily-available place.